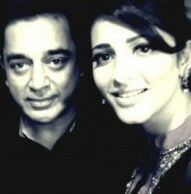 Kamal and Shruti in a film together? Looks like we may see Shruti Haasan and her daddy cool, Kamal Haasan, together in a movie soon, according to reports emerging from Hyderabad. The actor who was in the capital state of Andhra was heard mentioning to the press that he has the story ready for the project that will feature himself and his daughter Shruti. Shruti has already made a name for herself in the Tamil and Telugu markets and is currently busy with her two Telugu films Balupu and Yevadu along with her Hindi project under Prabhudeva’s direction, Raamaiya Vastaavaiya. It is believed that her project with Kamal is most likely to be a trilingual in Tamil, Telugu & Hindi.